Today I am going to share Britain’s best kept beauty secret with you and would like to share my review about this multi award-winning 3 Skin care steps . Checkout my review for Liz Earle’s Cleanse & Polish Hot Cloth Cleanser HERE. For Bottle : Moisten a cotton wool pad and sweep over face and neck every morning and night after cleansing with Cleanse & Polish Hot Cloth Cleanser or using one of our special treatment masks. For Spritzer : Spray a fine mist lightly from approx 20cm for an instantly refreshing , reviving boost. Whether your skin is dehydrated, oily, dull or congested, the nourishing and brightening botanicals will help to leave your skin feeling soft and looking fresh for longer. It also primes your skin perfectly for your choice of Liz Earle Moisturiser. I totally fell in love with the product after just one use. As i said earlier , I was little scared in the beginning to test any skin products, as my skin is super sensitive and has the tendency to breakout easily. But I am super glad that I did. Liz Earle toner comes in two types of packaging with different sizes : Bottle and Spritzer . I choose the SPRITZER one ( FYI : Spritzer is like a spray where as Bottle is just plain bottle) I love the packaging . I simply spray my face after cleansing and it literally feels so refreshing. The texture is good with a very strong refreshing fragrance in it which fades within few seconds (great isn't it ). The pump is very user friendly. It leaves my skin very soft . I believe it would be a great product for summers as well when you really need something that can instantly gives you very instant refreshing , reviving boost.I am using it on regular basis. It didn’t break me out at all. I must say that I am impressed really !!! I soo love this product and will definitely keep using it in future. Definitely Yes, it’s a must try product. 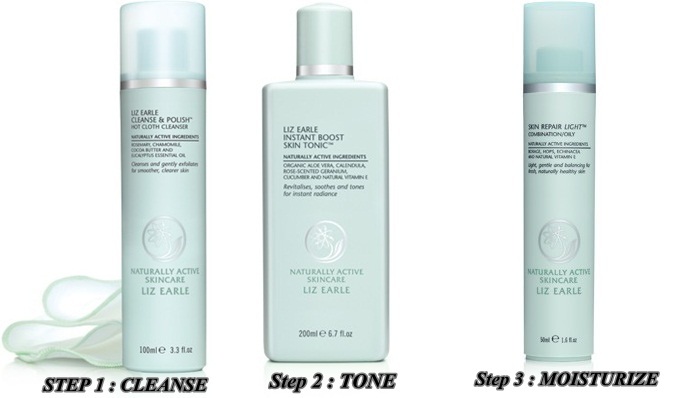 However , Liz Earle INSTANT BOOST ™ SKIN TONIC comes in different sizes (30 ml bottle/spritzer to 200 ml tube ) and costs accordingly ( 5.00 £ to 12.50 £ ) . For different size and price information, you can check Here Liz Earle ships worldwide with a very secure packaging. Light and gentle, this easily absorbed moisturising lotion is ideal for combination, oily or problem skin. To tell you the truth , i am always afraid of using any kind of moisturizers on my face as my skin is super oily and super sensitive. But i must say that this one was worth trying. Liz Earle team asked some basic questions about my skin type before sending this product . And thanks to them as it worked super great for me. The texture is creamy with some fragrance in it which fades within few seconds (great isn't it ). The packaging is very user friendly. It leaves my skin very soft and not at all oily . I wonder would it work for me in summers as well . I am using it on regular basis. It didn’t break me out at all. I must say that I am impressed really !!! However , Liz Earle INSTANT BOOST ™ SKIN TONIC comes in different sizes (15 ml tube/pump to 50 ml tube ) and costs accordingly ( 7.00 £ to 18.25 £ ) . For different size and price information, you can check Here Liz Earle ships worldwide with a very secure packaging. You can check Liz Earle website Here. You can also join Liz Earle on Facebook And Twitter. Face up to the colder months with Liz Earle amazing new autumn and winter skincare essentials offer! If your purchase Their three Daily Essentials (Cleanse & Polish, Instant Boost Skin Tonic and their Skin Repair Moisturiser) they will treat you with a little extra luxury, with a free Superskin Concentrate 10ml roller-ball worth £19.00! Face up to the colder months with their intense, aromatic blend of 100% pure plant oils. Simply apply before your usual moisturiser for an extra boost during the colder months. Great review <3 I love using these products!!!! I haven't tried any Liz Earle products yet, but I am dying to. Do you think these products would be okay for sensitive skin?